Due to sheer volumes required, chipboard panels are among the most popular products in the timber industry. FunderMax, a renowned supplier of wood- based and compact laminate solutions, sets great store in high-quality manufacture. To guarantee this, FunderMax engaged Geroldinger, the Upper Austrian bulk goods specialist. When it comes to storing difficult bulk goods, building materials manufacturers like FunderMax do well to come to GEROLDINGER. For its chipboard production, FunderMax requires not only that storage facilities are watertight, but also that they are able to handle urea, which is extremely difficult to store. Since urea is a very hygroscopic bulk good that may form hard crusts because of its capacity to absorb water, it is normally kept in Big Bags or open in warehouses. Because of possible clumping and crust formation, storage in silos is seen as very risky. “The challenge with this project consisted of controlling the dosing from a large volume of urea down to a very small volume so as to best supply the subsequent process,” is how Managing Director Walter Geroldinger describes the main task. GEROLDINGER set itself this challenge and for the storage of 60 tonnes of urea (about 2 silo trucks) it created a space-saving, environmentally-friendly solution with an octagonal Multigon silo (65m3). This special silo facilitates easier crust breakup thanks to its flexible walls and, with the aid of the tried-and-tested ‘Oszillomat’ system, it allows for even discharge of the urea. To avoid variations in volume and to guarantee constant bulk goods delivery for inclusion in the customer’s process, dosing screw conveyors were installed to ensure the required urea micro-dosage. 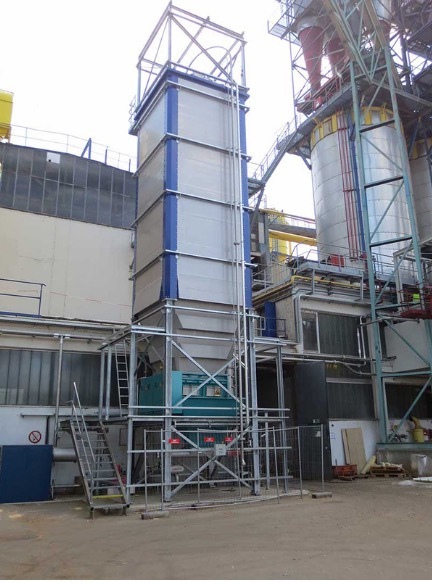 With its flawless storage and materials flow design of the flame retardant, which is also required, GEROLDINGER ensured the successful completion of this major project and was able to hand over a turnkey plant.